No matter how time changes, nothing can ever change the utter joy that a gift brings to us all. Especially to a child, every gift is a reason for pure happiness and a possession of great pride. There is indeed no dearth of gift options for kids in the market nowadays. But in order to make your little one feel extra special one can come up with some special gift ideas. Here personalised gifts can come into play! Personalised Baby Basket - For infants, both boys and girls, this is in fact a great gift. These baskets can consist of useful and adorably designed items that come in use for baby care, for instance baby nappies, an ultra comfy soft cot blanket and baby bib that are embroidered with the child's name, a specially designed photo frame and other such needful items all put together with a personalised ribbon and a storage box to safe keep these adorable items for life. Personalised Backpacks For Kids - Imagine a wonderful kid's backpack in a unique animated ladybird or cute monkey design? Your tiny tot is going to love it for sure! To add to this uniqueness your child's name is embroidered or printed on such backpacks. Now can it get any personal than this! Your little man or darling princess is sure to take pride in having such an exclusive gift. Personalised Pencil Cases For Kids - Kids love their pencils and colours and to safe keep them you can gift them a pencil case different from the rest. This case will have your child's name on it and a pattern and colour scheme that your child will truly love! Baby Photo Album - Now this is definitely unique for each child will have his own priceless memories of his growing years. This is a gift that he will look back at to relive those beautiful memories when he grows up. Personalised Kids Raincoats - Yes, kids love the rain and it is needless to say that they end up loving a cool, colourful and specially personalised raincoat. These raincoats are so unique and fashionable your child will never want to let go it! So what are you waiting for? 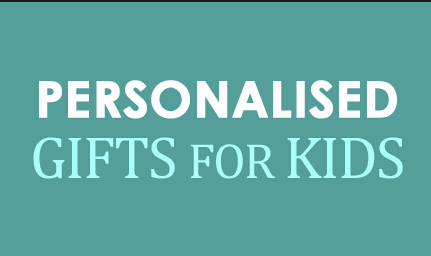 Who needs a birthday or a specific event to make a child feel special; gift one if these personalised gifts to the apple of your eye and see him shine gloriously with joy! Previous: 5 Key Steps When Buying One Raincoat for Children Next: What Is PVC Plastic and What It Use For ?